I've been trying to make pumpkin gnocchi since I'm 15 years old, and until last week it had always been an absolute disaster. 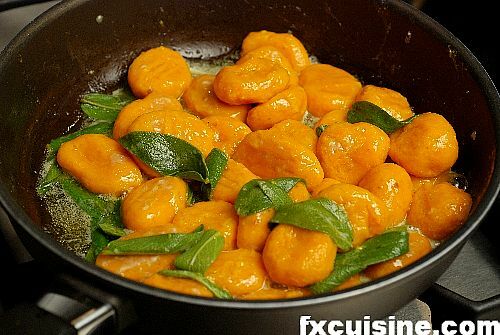 The gnocchis (Italian dumplings) would just dissolve in the boiling water and whatever part you could fish out would look like oranges sponges that fell into the dishwasher. I had tried everything - bake the pumpkin first to dry it out, add a truckload of flour or combine with potatoes. No joy, until I tried a Lombard recipe from a Slow Food cookbook in Italian. 'The secret', they said, 'is in the pumpkin.' And indeed it is. Using potimarron (Hokkaido squash or Kuri Pumpkin) only very little flour was needed to turn the most delicious gnocchis I have ever eaten. 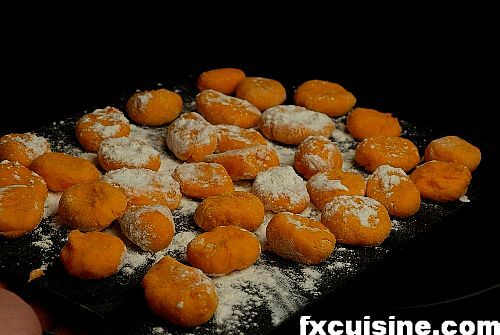 And when the next day I tried it again with a very dry pumpkin of a different sort, I was back to disaster and had to use more flour than pumpkin for the gnocchis to withstand the cooking. 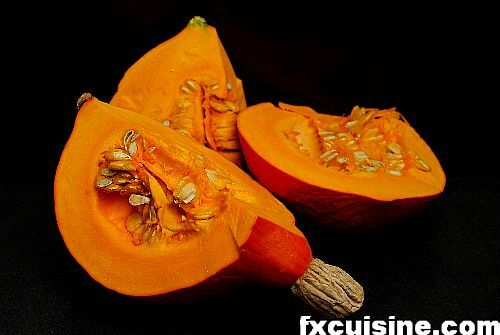 Slice the squash in 4 pieces and remove the seeds but leaving the peel on. Bake in a covered dish in a hot oven until soft, 30-40 minutes. Discard any juice and peel or scrape the flesh off with a spoon. Mash to a smooth pulp. Fill your largest pot with water, salt and bring to a boil and keep ready for the gnocchi. 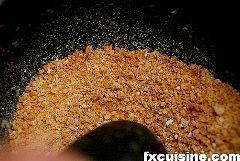 Crush a couple amaretti (Italian macaroon made from apricot stones) in a mortar. 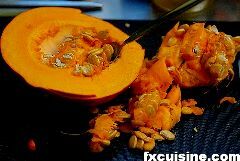 Do not bother to remove the sugar, the squash is already quite sweet and you won't notice it. Matching sweetness with bitterness is a long established way of eating pumpkins of all sorts in Northern Italy. Combine the smashed squash with the crushed amaretti. Add just enough flour for the dough to hold together. 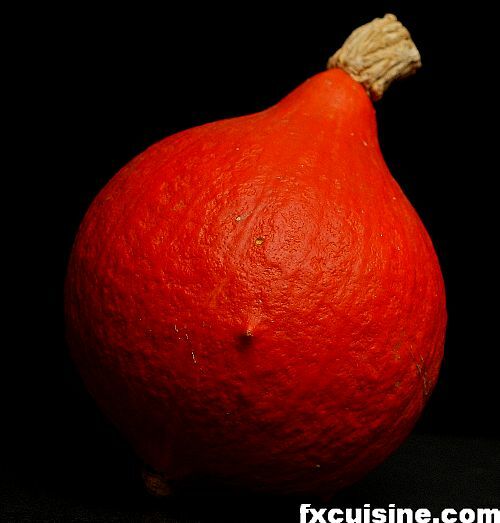 If you are not sure, try to form a small ball in your hand as explained hereafter and boil it in your pot. If the gnocco holds together and comes out without having absorbed half the water in the pot, then there is enough flour. Flour a board and take a little dough in your hand. Either form balls the size of a small walnut one by one, or roll a long cigar which you will cut down in small gnocchis. Finish them by pressing a fork on one side of each gnocco (for the butter to stick better). Try to use as little flour as possible at this stage. If you make big lumps of flour on the gnocchis surface like I did here, the flour will not disappear in the boiling. You'll see it. Plunge the gnocchi in the boiling water. Please do this with care as the raw gnocchis can lose their shape if you drop them into the pot from the ceiling. Ideally use a slotted spoon to do this, but make sure they all enter at the same time, or just make separate batches, or the cooking will not be even across the batch. Cook only for a minute or so. If in doubt, taste one gnocco. Good gnocchi do not need sauce. 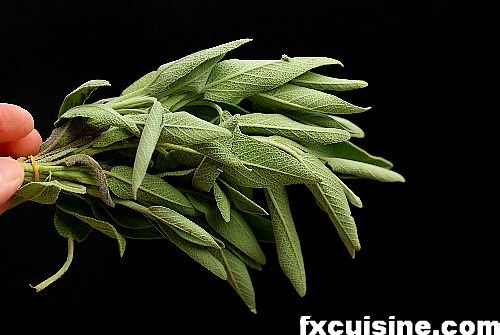 The most delicate flavoring you can use is sage. For reasons known to chemists only, the delicate perfume of sage cannot be properly extracted in water but is readily soluble in fat. 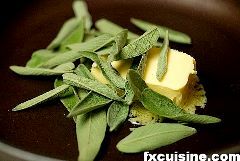 In a small saucepan, melt as much butter as your diet can afford and add the sage leaves. 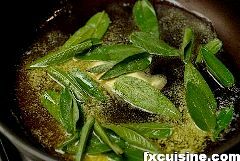 Do not fry them but just let the butter melt quietly and the sage leaves bathe in it. You could remove the leaves as most of their taste is now in the butter, but guests prefer to see where the flavor comes from and the stripes of green match very well the pale orange color of the pasta. Transfer the gnocchis into the sage butter and leave on a very low flame until ready to serve. Serve with freshly grated Parmesan cheese and if needed a few crushed amaretti. These are the best gnocchis I ever tasted or made - period. 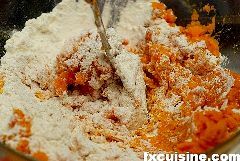 You could very well make them with a different type of squash than the one I used, but if your dough is too runny you'll have to add so much flour your gnocchis will deserve the name of priest-chokers. Even so, they would be edible but the balance of tastes would be all wrong and the texture very floury. Good luck! FX-- these look phenomenal! I would like to make them for my family during the Christmas holidays. Could you answer a couple of questions for me? What size pumpkin did you use (do you know how much it weighed)? Also, what quantity of gnocchi does one pumpkin make? I've never experimented with this before, so I don't know how to estimate quantities here. thanks so much! your site has become one of my favorites! Interesting. 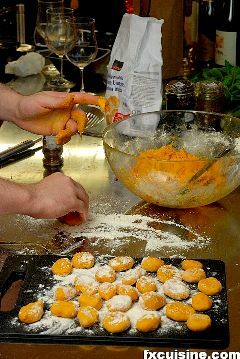 My lady sometimes makes pumpkin gnocchi and she never had any problems with -she isn't a master-chef by any means. We never thought of them as being particularly difficult. How strange! I guess our local supermarkt's default pumpkins are the right ones. Lucky us! 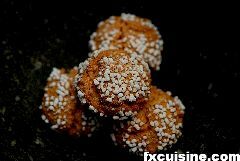 Thanks Macha, let me know if the pumpkin-amaretti gnocchi work for you! What is the secret in the potimarron? Why are other pumpkins missing it? 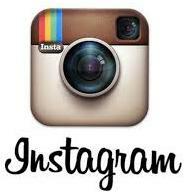 Are their other pumkins sharing it?BTW I like your blog: beautiful pictures [cooking & making pictures at the same time? ], instructive recipes & results which seems to be delicious. Thanks! Yes indeed the potimarron is a pumpkin turned into a prince. Buy as many as you can carry when they are in season. Hope to see you around my blog! 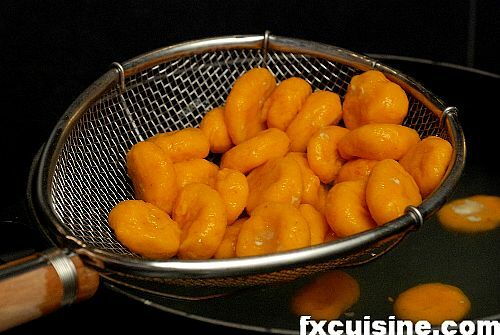 Monika, I am very pleased to hear you had a good success with my pumpkin gnocchi recipe, sometimes it doesn't work with some types of pumpkins. Write down the name of the pumpkin you used and it will work everytime! it's a disaster - today I cooked your gnocchi recipe - wel what should I say the dough was still to runny after I don't how much flour - I some how managed to form paste. However their was no pumpkin taste left and it was hard as stones... I consider my self as a quite knowledgeable and experienced hobby cook, but I have no clue what I did wrong. I used the right sort of pumpkin I followed the instructions (what I normally hardly do... well I don't know. ps don't worry still like your side! FX's answer→ Stefan, I am very sorry to hear this but not entirely surprised. 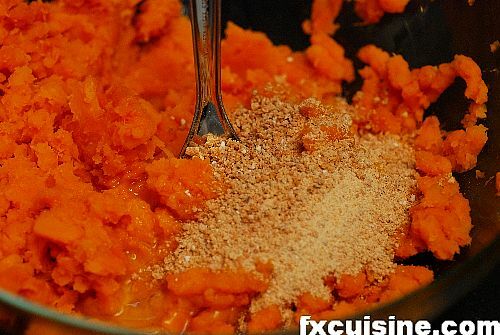 Depending on the starch and water content of your pumpkin, this is something that can happen. If it's any consolation, you should know that it happens to me from time to time. Hey FX! Thanks for your quick answer! And no need to be sorry. However I thought a while and I think I have an idea. I used a pumpkin from a local farmer. 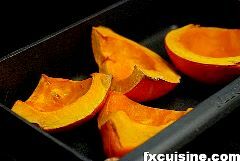 A couple of weeks ago I prepared a curry with one of these and even I cooked it in the sauce the pumpkin pieces where rather dry. So I got reminded on your gnocchi and I bought an other one last week, but what happened with the pumpkins int that short time. Well the weather turned from a nice still warm Indian summer into a golden autumn with freezing cold nights. 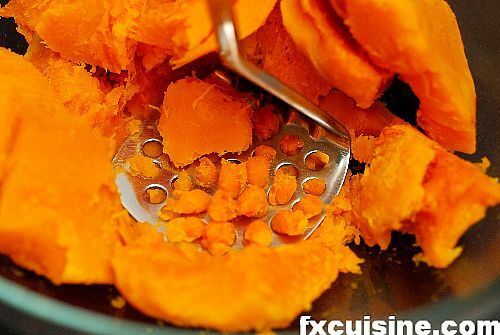 That doesn't hurt the pumpkin but it changes it's starch structure as it does for Brussels sprouts. The sweeter yet shorter starch chains can't bind the water as god as the long, but attract it even more and this leads to the disastrous result. I could experiment that out, by buying an other one from a warmer place of the world cutting it in half freezing one half and comparing the results... However I am into cooking not in food chemistry. 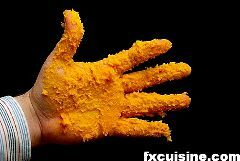 FX's answer→ Stefan, I have wasted God knows how many fine pumpkins trying to make gnocchis, only to end up with a pot full of flour and pumpkin soup. I would really love to get to the bottom of this and be certain of getting good results every time. Type of pumpkin? Acid test to see if the flesh is OK? 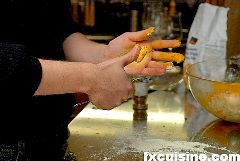 There are so many ways of making these gnocchi in Italy. For instance, in various parts of Italy (northen Italy) they add some nutmeg and parmisan cheese to the dough to make it tastier. Also, most of recipes contains an egg to confer some tougher texture after boiling. 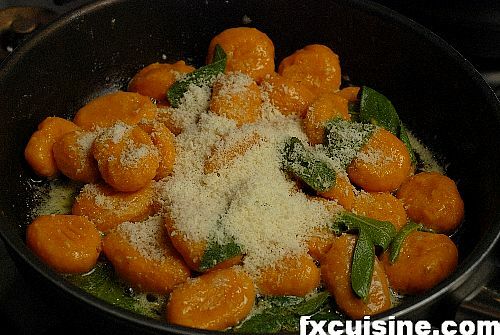 Also the dough being runny is not generally considered a problem as the gnocchi are boiled one by one soaking into the boiling water a teaspoon of these "cream" and wait until become solid. Well they don't look well rounded as yours but still very good. 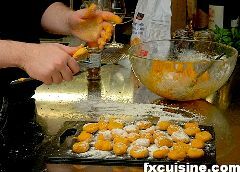 Another way some cooks use is putting the creamy dough into a sac-a-poche make gnocchi by cutting small pieces with the help of scissors. I am loving your new blog!! I was inesetetrd in your gnocchi recipe. Can you tell me how much flour and what type of flour it calls for (bread flour or all purpose)? I used to make these with my Aunt Mary. We also made home made spaghetti by rolling the dough on a metal clothes hanger. She use to cut the bottom part of the hanger off and we would roll the dough on it and slide it off. You brought back some very nice memories for me! Thank you! 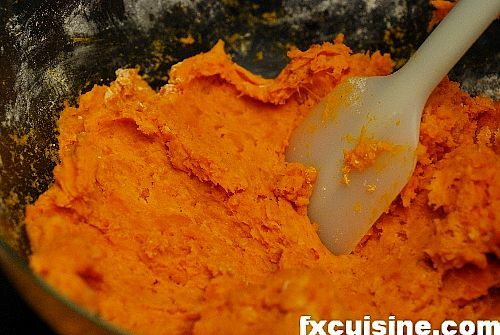 FX's answer→ Normal cake flour and the pumpkin will tell you how much you need!